(19184.129.b, Althia Hart Collection, OHS). (8470.17, Grant Foreman Collection, OHS). When the Civil War ended, the big question concerned the state of the freed slaves of the South. Recovery of the southern economy depended on getting the freedmen back into the cotton fields. During the period of Reconstruction the Radical Republicans in Congress tried to convert the freedmen into small free-holding farmers, but the former slaves were simply not ready to manage their own farms. What emerged out of necessity was southern farm tenancy, a system of near slavery without legal sanctions. Instead of working in gangs as they had on antebellum plantations, the freedmen became tenants. 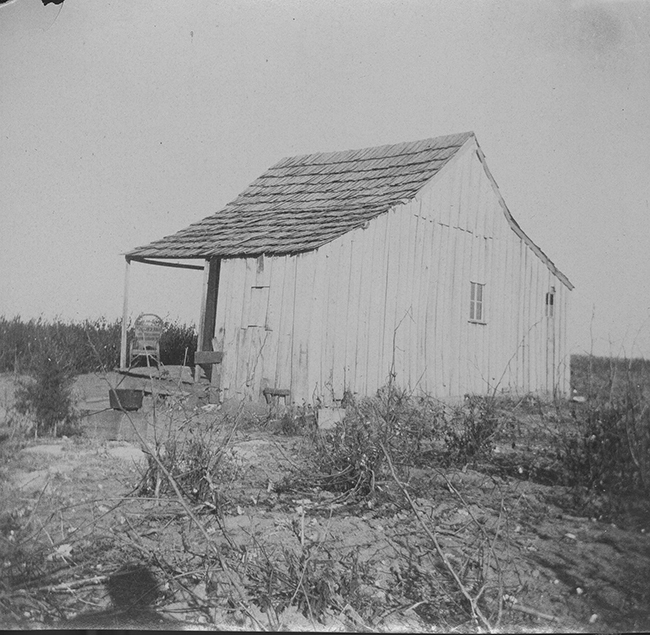 The planter or landowner assigned each family a small tract of land to farm and provided food, shelter, clothing, and the necessary seeds and farm equipment. When the crop was harvested, the planter or landowner took the cotton to market and after deducting for the "furnish" (the cost of the items the tenant had been furnished during the year), gave half of the proceeds to the tenant. This arrangement became known as sharecropping. Unfortunately, tens of thousands of farmers fell down the tenancy ladder rather than moving up it. Some farmers lost their farms or their status as cash or share tenants because of crop failures, low cotton prices, laziness, ill health, poor management, exhaustion of the soil, excessive interest rates, or inability to compete with tenant labor. Many tricks of nature (drought, flood, insects, frost, hail, high winds, and plant diseases) could ruin a crop. Sharecropping and tenancy remained accepted as a normal part of southern life until the Great Depression. Then the realization took hold that the tenancy system desperately needed reform. However, the early New Deal's agricultural programs brought no change. Based on drastic acreage reduction and benefit payments that went mostly to landowners, in actuality the programs were a disaster for tenants and sharecroppers. When planters and landlords reduced their acreage in production by 40 or 50 percent, they reduced their tenants by the same amount. Although there are similarities, the story of tenancy in Oklahoma does not fit the pattern of southern farm tenancy. The differences are dictated by the unusual history of the white settlement of Oklahoma. By 1880 the American agricultural frontier was ending. Indian Territory offered about the last frontier for good farmland. Indian rule prohibited white land ownership. Nor could Indians lease their land to outsiders, but they could employ whites to work their land. Under the subterfuge of being employees, a flood of white tenants came into the territory in the 1870s, 1880s, and 1890s. By 1900 three-fourths of all tenant farmers in Oklahoma were white. Some of these early arrivals acquired ownership by purchase, connivance, or intermarriage, but a deadly combination of economic and natural forces kept most from climbing the agricultural ladder. Between 1900 and 1910 the numbers of white tenants doubled. When the laws changed after statehood and non-Indians were allowed to buy land, tenancy slightly declined. However, in the adverse years of the 1920s, when agriculture suffered from low prices and overproduction, white tenancy rose again to nearly 70 percent. By 1935, with 119,615 white tenants, Oklahoma had the highest rate of white tenancy in the United States. In the usual arrangement with share tenants in Oklahoma, the landlord received one-third of the grain crop and one-fourth of the cotton produced. The tenant had to provide most of the equipment, animals, and furnish. Realistically, farming forty or fifty acres on this basis was a prescription for poverty, especially when cotton prices plunged. Tenancy did not necessarily equate with poverty, but in the southern tier of counties and in the triangle of Southeastern Oklahoma, tenancy devolved into much the same poverty-ridden system that existed in the Deep South and Texas. Landlords made tenancy arrangements by oral contracts for one year only. At the end of the year most tenants moved on in search of a better place. Landlords encouraged moving because it prevented the development of an established tenantry. Because of a constant surplus of tenants, or renters as they were called, at the end of the crop year landlords easily recruited new renters, often on terms even more favorable to the landlord. In 1920 fully two-thirds of all tenants moved from one farm to another. Because this system of land tenure was so transitory, the landlord was required to provide nothing but the land. While this yielded a thin profit on very little investment, it was the road to disaster. Neither the one-year tenant nor the landlord had a reason to make improvements on the land or to practice conservation. Essentially, they mined the soil. Carried to its logical conclusion, soil mining would leave the land eroded and exhausted. Production would cease, and the landlords, the tenants, and the land would all be ruined. Black tenancy in Indian Territory has a similar story. All of the Five Tribes had black slaves. When the tribesmen were removed to Indian Territory, they brought their slaves with them. By 1840 many cotton plantations existed in the Choctaw and Cherokee Nations, mostly in the fertile river bottoms of the Arkansas and Red rivers. Most plantations had several hundred acres in cotton and dozens of slaves to do the work. The Civil War disrupted the plantation system in Indian Territory, and after the war most planters lacked money and manpower to resume operation. Post-war treaties between the U.S. government and the Five Nations required that slaves be freed and become citizens of the tribes with rights to land. Despite a delayed process, eventually most freedmen received land allotments of at least forty acres. While this kept them out of farm tenancy for a time, in harsh reality a forty-acre farm is not big enough to allow a farmer to get ahead. In all likelihood, many of the freedmen lost their small farms and did so for the same reasons that white farmers lost theirs. In 1930 Oklahoma had 22,937 black farmers, 14,559 of them tenants. Compared to 180,929 white farmers, 110,770 of whom were tenants, the numbers of blacks are quite low. As only a few thousand Indian slaves became freedmen, it does not seem likely that all black farmers in Oklahoma were their descendants. Many must have migrated to Oklahoma as employees or tenants of Indian landowners, or later on as homesteaders or displaced tenants. It is clear that the kind of plantation-oriented black sharecropping that existed in the Deep South after the Civil War never developed in Oklahoma. In fact, the number of black sharecroppers, only 4,560 in 1930, was quite small. Interestingly, there were 16,495 white sharecroppers at the same time. Generally, the black croppers and tenants had smaller farms that were less productive, lowering their standards of living and making their tenure on the land even less secure. A growing national problem in the 1930s, southern farm tenancy ended abruptly during and after World War II. Government programs, mechanization, and their own inefficiency drove tenants from the land. Jobs and a better way of life lured them to urban areas. The well-known story of the Okies and their migration to California vividly illustrates the end of southern farm tenancy. Few Americans would mourn the passing of such a system. David E. Conrad, The Forgotten Farmers: The Story of Sharecroppers in the New Deal (Urbana: University of Illinois Press, 1965). Sheila Manes, "Pioneers and Survivors: Oklahoma's Landless Farmers," in Oklahoma: New Views of the Forty-Sixth State, ed. Anne Hodges Morgan and H. Wayne Morgan (Norman: University of Oklahoma Press, 1982). 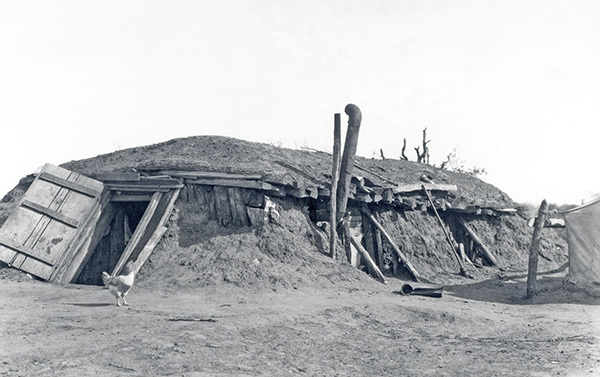 David E. Conrad, "Tenant Farming and Sharecropping," The Encyclopedia of Oklahoma History and Culture, https://www.okhistory.org/publications/enc/entry.php?entry=TE009.